For those who haven’t heard about Slack already, I’ll try to explain it briefly. 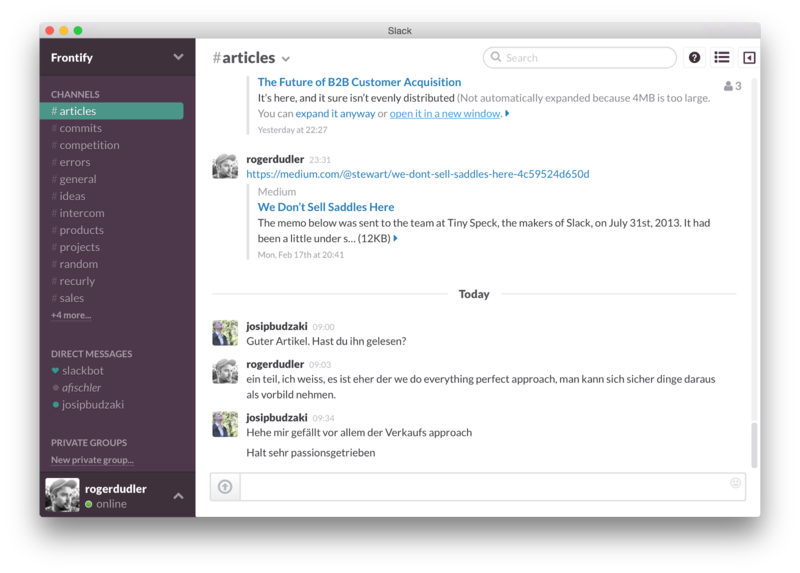 Slack is an application that enables push and pull communication with your team and tools. Slack is especially useful for internal business-related communication. It has the potential to boost your team’s efficiency. Slack is a bit like IRC, but more human. It’s like Skype, but more flexible. Similar to HipChat, but prettier. It’s just awesome. At Frontify, we love it – I’ll tell you why. Slack does not only provide simple chat functionality based on 1 to 1 or group conversations, but it works with the concept of channels. You can create your own channels for the topics you wish. Discussions will happen within the right channel to keep context and don’t create an overall noise for the team. Besides human chat activity, machines can also start sending messages into channels with the help of integrations and commands. This is how our Slack client looks currently. Our team members are able to opt-in on specific channels to see the activity within a topic and get notifications, but will not be disturbed by everything happening. You’re able to just ignore channels, that are not important to you at the moment. Since we have a lot of external services we interact with in our daily business, it took a lot of effort to gather all relevant information. We now use Slack to centralize notifications from all our external services and our own product. For example, we’re using Recurly to handle subscriptions and payments. If a payment fails, we get a notification in a special channel called “recurly”. We also have a channel for errors on our production servers, where we use Bugsnag for tracking them and the Slack integration to get notifications in a “errors” channel. For customer communication, we use Intercom, a next-generation real-time CRM. We keep the team informed about important customer feedbacks here as well in a “intercom” channel. Everyone is in the loop – I call it Structured Noise – Pausing allowed. One of the coolest features of Slack in our opinion are commands. They allow you to define a command, like “/<command_name>” and let a webservice respond with a message. We’ve added a “/whois” command, which enables us to get some application-specific metrics about specific users, directly feeded by our own API. Think of chatting with your application in real-time, no more browsing to hundreds of statistics sites, tools, analysis by hand. By providing such commands, you’ll give the people the power to be efficient and eliminate repetitive work. Slack also offers interesting features for file sharing, search and more. To be honest, we don’t use them extensively yet. It works, but does not bring us the huge value we see in other features. But for your business, it might also be very useful. What I think is absolutely outstanding about Slack, is the overall experience. From the website visit, to the sign up, through the on-boarding and finally the day to day usage. Everything is made with love to details, a perfect experience for everyone in the team. Whether it’s on the desktop, the tablet or on-the-go with the provided mobile apps. Everyone in our team loves Slack and it’s details – Josip once tweeted “I could watch the @SlackHQ animation forever”. It’s hard to implement team communication tools, whether it’s about chat, about know-how sharing or anything else involving the whole team. It’s always about tools and processes, but tools like Slack can help you simplify your’s, rethink and optimize your workflows with automation. We don’t know how it works out for bigger teams, but you should definitely give it a try. By the way, we don’t get paid for writing this, it’s just that we fall in love with a service and we dont’ want others to miss this. At Frontify, we will continue to streamline our processes and keep track with innovative solutions. We think it’s valuable to share our experience about the journey – hopefully you enjoyed the insights about Slack. Founder & Head of Product @Frontify.